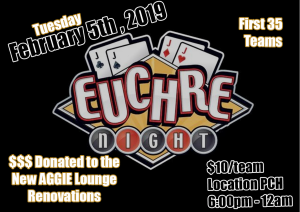 The annual Euchre Tournament will take place on Feb. 5th, 2019. Cost will be $10/team, don't delay sign up today! Email vpinternal@aggies.ca if you would like to take part in the tournament!